Healthy lunch meals don’t need to break the bank, and fuelling yourself with hearty, nutritious food can make the difference between a 3 o’clock energy slump or being able to power through your day. Harvard Health says that, “researchers have observed that the circadian rhythms of people who don’t eat lunch typically show a more pronounced afternoon slump.” Research also suggests that you should keep your meals at lunch on the smaller side, but that the ingredients you choose should still pack an energy punch. This means a good balance of protein, carbs and vegetables, eaten in the right portions. Often when we work 8 or more hours a day, the option to have a healthy, balanced lunch can seem like a challenge. 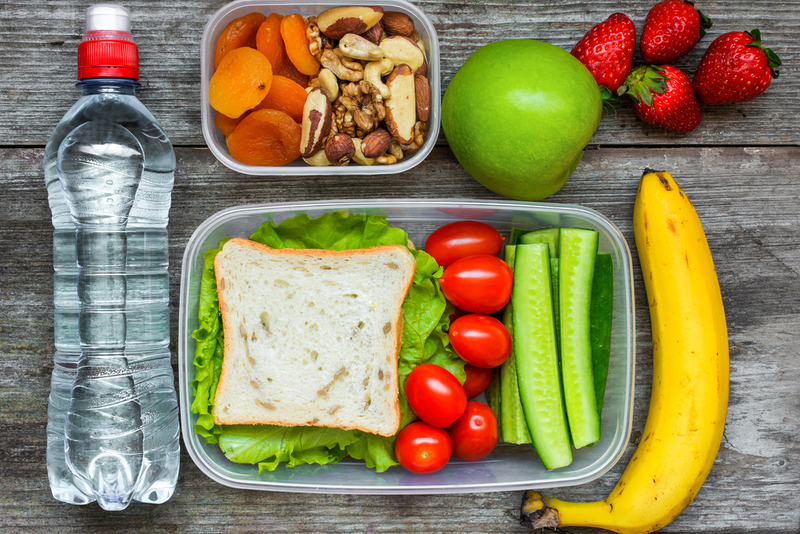 Better Health has some great pointers on how to get into a routine at lunch, and gives many tips on making life easier, such as finishing your lunch with a small, healthy treat, and making sure you have enough containers. Shockingly, research has found that Australians spend $8.3b a year on buying lunch at work; the survey also found on average, Australians spend $129 per month just on buying lunch. That’s actually less than $6.50 per day; so if you spend more than that, your bill is likely to be much higher. If (like many of us) you spend $12 a day on lunch, that works out to be $60 per week, or $2800 a year on lunch! A great way to save a few dollars in to stock up on healthy food you can find at your local supermarket. All the food items below come from some of Australia’s top supermarkets and shops; Woolworths, Coles, Aldi, IGA and Bakers Delight – but honestly, you could find many or even most of these products just about anywhere; so shop around and find the best bargains. Fruit and veg is also seasonal, so buy what’s in season to get the best deals. Avocados might be cheap today, but might blow your budget tomorrow. At SkillsTalk, we have tried to come up with a week of meals for you; including vegan, vegetarian, gluten free and meat options. We’d love to hear your ideas as well, so please let us know what you’re having for lunch by heading to the comments section at the end of this article. Also check out 10 brain foods to help you boost your productivity. Please note: All prices and links are correct at time of publication, but check your local retailers for most accurate prices and availability. These meals are intended as inspiration only. Let's go through the week, from Monday to Friday, and see what we can put together from your local supermarket. If you're vegan, veggo or even gluten free, you should be able to simply substitute one or two ingredients to make something that suits your needs. There’s nothing more delicious than a good ham sandwich at lunch, made more deluxe by adding a cape seed roll and Mrs Ball’s chutney. Yes, it’s a very funny name, but the product is delicious, cost effective and keeps well, even without refrigeration for a couple of hours. Cape seeds contain healthy omega 3 fatty acids, and are great to keep your brain synapses firing throughout the afternoon. There is a great product made by several brands that’s like pulled chicken in a packet. It has a different taste and texture to regular chicken slices and can be a great addition to salads. Babybel cheese is a great French product that’s very high quality, and now comes in cute snack sized portions perfect for lunch or a snack. Add a can of four bean mix and gain all the nutrients and energy that this hearty legume mix will deliver your tired body and mind. Vegans rejoice! Tofu now comes in many delicious flavours in the cooler section of your supermarket and they’re so good, you don’t need extra sauces or dressings. Steam your broccoli pieces in your work microwave, bring them lightly steamed from home (make sure they still have some ‘snap’) or even eat the broccoli fresh. Add a handful of Brazil nuts, and some delicious corn kernels to sweeten up the dish and you have a healthy vegan meal that will keep you satisfied until dinner – guaranteed! Full fat cream cheese is often gluten free, but make sure you check your local labels to be sure. Aldi now has a wonderful range of gluten free products, which are more cost effective than ones you might find in a traditional health food store. Gluten free bread can go stale quickly, but it freezes well, and the addition of the seeds and gogi berries are a superfood to make this healthy lunch meal one that really packs a nutritious punch. If you’re not sure about gogi berries, then substitute for cranberries or any other type of dried fruit or nut. Many of the large supermarkets now do a great range of salad tubs, often including a tiny fork and dressing sachet, all for around $5. However, if you’re keen on saving plastic, you can easily make your own, but these are a great option for those on the go. Add a tin of delicious spicy tuna, then snack on some cheese and crackers if you’re still a bit peckish. This is one lunch that is satisfying, healthy, tasty and full of great nutrients. Love healthy food? Could you become a nutritionist? Find out more about how to become a Nutrition Educator or a Nutritionist including salary information, industry insights, growth rate of the occupation and more. If you’re keen on studying nutrition, then check out the 084577G Bachelor of Health Science (Nutritional Medicine) which is available to do online and on campus, at your own pace. The 36 units of this bachelor degree cover knowledge and training like biological and social sciences, nutritional and clinical studies, human nutrition, nutritional science, food packaging and public health nutrition. Find out more about the Bachelor of Health Science (Nutritional Medicine) on the Upskilled course page.